4+ years ago I wrote an article titled Why I Love Yoga and Other Thoughts on Whole Food, Whole Health Healing. I have shared, many times, the ways in which Yoga benefits healing body, mind, and spirit. Type "Yoga" into the search bar, over there to the right, and you will find Yoga posts on weight loss, healing, body benefits, stress... you name it. I recommend it. Yoga that is. Yoga is a self healing retreat every time you step onto the mat and every time you step out into your world living life from a space of deep interconnectedness that Yoga spins and weaves for you; that you spin and weave for yourself. 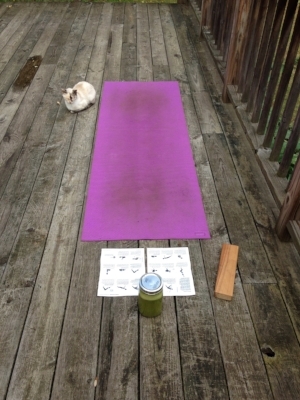 If 45 degrees F... yoga on the deck is my preferred place to practice. Yes, cats are a reoccurring theme in this mindfulness; sensing & appreciating the peaceful energy. So often people tell me: "Oh, I do stretching exercises, I don't need yoga." Most people equate yoga with doing poses. Yoga is not just about the poses on the mat. That is part of it. Yoga is a way to bring presence of mind to your daily awareness. The poses are a way to embody mindfulness. Poses help to move life force energy, embody breath with movement, and guide our actions into a conscious connection with our true self. Poses support you synchronizing breath with body, mind, and spirit. Breath is spirit. Yoga poses teach you how to be strong, flexible, and balanced in body, mind, and spirit so you can step off the mat and be strong, balanced, and flexible in all areas of your life activities, in all of your interactions, in your essence of being in this world. Yoga is a way of being in the world that supports our moving with the flow of the universe, making conscious decisions based upon thoughtful wisdom and mindfulness around choice and consequence, and walking through daily happenings with a presence of peace and contentment (even when life seems to hand us chaos). Magic happens when a person practices Yoga. Yoga is a tool to connect self with life force energy: inner life force energy and the life force energy of the universe (which are one & the same). The universe pulses on and with life force energy. Practicing yoga is a way of tapping into this universal energy, wisdom, consciousness. Yoga has been practiced for thousands of years. All indigenous cultures have healing systems for tapping into the infinite. Yoga Stick Figures by Charlotte Bradley of Yoga Flavored Life.